Drawing on skills learned as students, alumni are working in careers that promote good health — from cooking nutritious meals to running businesses that help improve well being to conducting research on cancer and exercise. Learn how UNT students, faculty, staff and alumni are helping to make an impact on the Denton Community Market. The growing nonprofit offers locally sourced goods for purchase by health-conscious consumers and was named among the best in the DFW area by the Dallas Observer. When Theresa Morrow Polley ('86) took her first power yoga class, she thought it would be easy. After all, she was an active runner and cyclist. But she was surprised by how intense it was -- and she liked it. "I was challenged to stay present and focus on my breath," she says. "It felt powerful. All of the problems in my life seemed small." Polley saw a change in herself. Now she's helping to bring about change in others. She owns and operates Retreat in the Pines in Mineola with her daughter Nina Herndon ('10). The center helps visitors combat the stress in their lives by offering yoga classes and retreats. 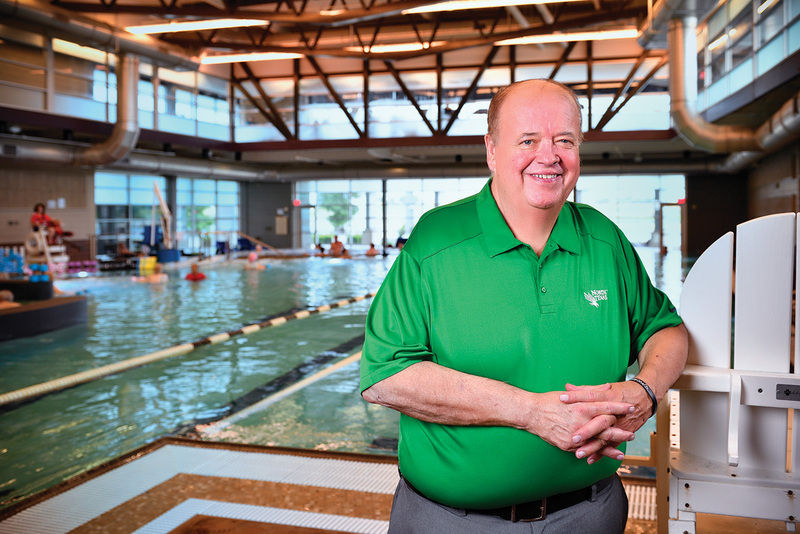 Polley is one of many alumni and others in the UNT community who are helping people lead healthier lifestyles -- whether they're encouraging physical fitness, cooking nutritious meals or conducting medical research that impacts people's health. UNT emphasizes health from the moment students arrive on campus. The Student Health and Wellness Center includes physicians, a dentist, dietitian, massage therapist and psychiatrist for students. The university created Mean Greens, the nation's first all-vegan college cafeteria, in 2011 and opened the Pohl Recreation Center in 2003. Used by students, faculty and staff, the popular rec center boasts swimming pools, a climbing wall, basketball and volleyball courts, and exercise classes. And, students can study a wide variety of disciplines, from kinesiology to hospitality management, in the fields of medicine, health and nutrition. Once students have graduated with those degrees, they have pursued careers in wellness that receive national attention. One alum works for the National Cancer Institute. Another's leadership garnered his city the top award from the National Recreation and Park Association. As director of Grand Prairie's parks, arts and recreation department, Rick Herold ('84, '85 M.S.) oversees not only the recreation centers, but also performing arts activities and the summer lunch program. "Our services are needed so much now," Herold says. "We change lives through physical fitness, but also emotional, social and spiritual health." 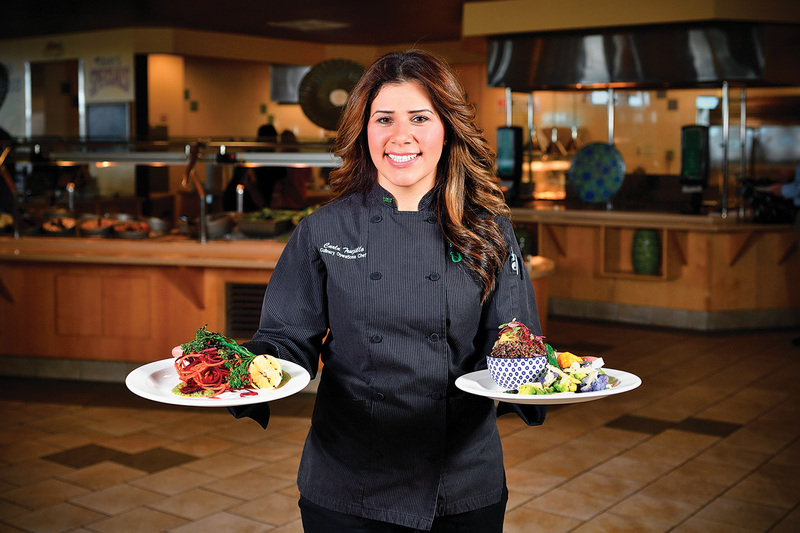 The quest for healthy living begins at UNT, where Carla Trujillo ('11), the chef manager for Mean Greens, has a mission. "I'm trying to make students fall in love with our food," Trujillo says. The first fully vegan university cafeteria in the country, Mean Greens in Maple Hall has won numerous national awards since it opened five years ago. And it provides Trujillo with an opportunity to use the lessons she learned as a student in the College of Merchandising, Hospitality and Tourism. While there, she studied all the basics of nutrition, finance and sustainability. After graduating with a major in hospitality management, she worked at several Dallas restaurants including Nordstrom's restaurant and Brookhaven Country Club before coming to Mean Greens in 2014. Mean Greens has been hugely popular since its inception. Some students eat all three daily meals there. The dining hall is a favorite with faculty and staff, and visitors drive from Dallas and Fort Worth to eat there. Students are eager to post pictures of their meals on social media. "I work to give them something healthy that's fun and creative," Trujillo says, adding that she takes pride in preparing food from scratch. "We eat with our eyes." Trujillo has learned how to make pancakes and other desserts without eggs or dairy. She creates her own sauces and seasonings, such as a Tuscan marinade that combines fresh herbs infused with oil and garlic. She prepares exotic foods and vegetables and has explored ethnic foods such as Asian and Indian. "Carla has done a magnificent job of bringing flavors from all over the world to Mean Greens," says Bharath M. Josiam, professor of hospitality and tourism management who served as Trujillo's mentor. He says that his health also has benefited from Mean Greens and that he has seen his blood pressure drop since eating there about four times a week. Trujillo gives credit for the cafeteria's success to the staff that serves 1,000 people a day. "The place is successful because of the team we built," she says. Living healthy extends beyond campus to the city of Denton, which has been ranked the fifth best college town in the nation by Livability.com. In addition to many parks, hiking trails and recreation facilities, and community activities that include yoga outside on the downtown square, Denton boasts a strong bicycling community. The Tuesday Night Bike, which has taken place since the 1980s and begins at the Language Building at UNT, attracts as many as 100 people each week. Several bicycling shops in town cater to such enthusiasts. 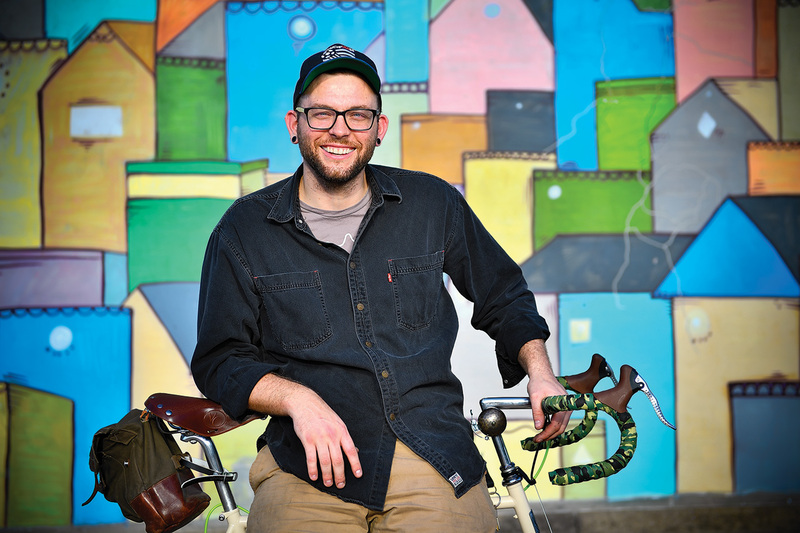 One such cyclist is Brandon Dupré ('11), who used his bike for transportation when he was at UNT. Now it's become his career. He says he took up cycling as a student because he wasn't getting enough exercise. He was busy with school and work, and a shoulder injury kept him from playing tennis, which he played in high school. 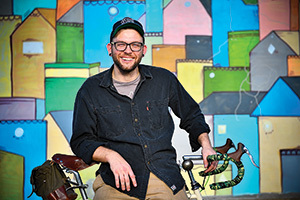 "The improvements that cycling made to my life and my health were amazing," he says, "and I developed a passion for cycling that has influenced my career and my art." Dupré is the owner of Sprockets, a bicycle store in downtown Denton that he took over in August 2015 from founder Sipo Thao ('08). He not only sells bikes, but also helps bicyclists repair their bikes. He says his degree in photography from the College of Visual Arts and Design has proven to be useful. "Photography gave me the ability for creative problem solving," he says. Dupré also advises customers about what bikes would work for their needs. One customer who weighed 400 pounds asked Dupré to custom build a bike to support his body. After a year, the customer lost 100 pounds and was able to trade in for a bike to fit his lighter weight. "It is so rewarding to help spark in someone else that feeling to do something positive for their health," Dupré says. "And to be able to do that for a living is truly a blessing." The influence of some alumni on healthy living has extended across the region, and they've earned national awards and personal rewards. Herold, Grand Prairie's parks director, practically grew up in the recreation center that was just a few blocks away from his childhood home in Farmers Branch. He played baseball and floor hockey at the center. As a teen, he coached 7- and 8-year-olds and landed a part-time job there. Then Herold discovered that working in a rec center could become a career. He majored in recreation and leisure studies at North Texas. "The professors were very engaged," he says. "I had a lot of opportunities to be creative." Herold now uses that innovation at his job. After working in recreation for The Colony and Euless, he began working in Grand Prairie in 2002. The city boasts 5,000 acres of parks with 62 facilities. He oversaw the construction of The Summit, a $23 million building that is the first recreation center in the U.S. aimed specifically at baby boomers. It includes exercise rooms, a swimming pool and even a movie theater. More than 5,000 members use The Summit -- sometimes spending the whole day there. One man says he lost 150 pounds after he enrolled at the center. The city is now building an $89 million facility, The Epic, scheduled to open in 2017. The general purpose park includes elements aimed at teenagers and features a recreation center, indoor water park and other amenities, such as a club and recording studio. It was in 2009 that Herold's leadership was recognized by the National Recreation and Park Association, which awarded the city its Gold Medal, the highest national award such a department can receive. It is a finalist for 2016 as well. Four members went to the 2009 national convention, while Herold stayed in Grand Prairie and watched the ceremony with staff members and city officials. "When they called out 'The winner is Grand Prairie,' it was incredible euphoria as everyone was running around giving hugs," he says. "It is a moment that will forever remain stamped in my mind." Yoga instructor Polley also has received recognition for her Retreat in the Pines -- including in Texas Monthly, the Houston Chronicle and the SheKnows blog. The blog Wide Open Country named it one of Texas' "10 great places to unplug." Creating a space for relaxation was Polley's intention when, in 2014, she founded the center on a 30-acre property that includes two log cabins amidst the pine trees of East Texas. It hosts retreats almost every weekend on yoga, meditation and other topics, ranging from Ayurveda to Zumba to a sound healing retreat with gong meditation and singing bowls. Polley runs the day-to-day operations and instructs several yoga classes, while her daughter Herndon provides business advice and helps cook. "The biggest thing that sets us apart is we're focusing on community and bringing women together for camaraderie," Polley says. "That's the beauty of the center, not only physical wellness but mental." Polley draws on her journalism degree and previous career in marketing to write a blog and her website's content. "This combines everything I love -- being with people, writing, marketing, teaching yoga," she says. Herndon, who also works as a corporate communications specialist at Nation­star Mortgage, drew on her entrepreneurship degree to help her mother. For instance, she suggested she hire more yoga instructors to keep up with the growing business. "Little by little she started making changes," Herndon says, which allowed Polley to be able to spend more time on being present with the women. Herndon says in one of her business ethics classes at UNT, she saw a film that encouraged her to look beyond profit and focus on the consumer. "We're not worried about making millions of dollars," she says. "We are trying to create a safe space for women to enjoy yoga, maybe even try it for the first time, with healthy comfort food and a little bit of wine and chocolate, while inviting them to experience the connection that we share with one another." When visitors come in, Polley notices they are stressed from work and family, but by the first yoga class on Friday, she can see their faces softening. By Sunday morning, she says they look like different people. Polley says she is most happy during gratitude brunch every Sunday when women describe how much they appreciated the food, the yoga and the energy from the other women. "Sometimes there are tears for overcoming a difficulty in their lives. Usually if one woman starts crying, we all start crying," Polley says. "There really are no words to describe that feeling." The UNT community also has promoted healthy living that has an impact on a national scale. 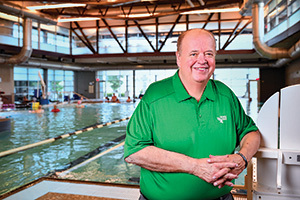 Don Lovelace, a friend of UNT and supporter of the athletics department, is the owner of Lily of the Desert based in Lewisville. The company is the largest certified organic grower and processor of aloe vera, known for its health benefits. And one alumna's research could improve millions of lives. Heather R. Bowles ('00, '02 M.S. ), an epidemiologist for the National Cancer Institute near Washington, D.C., is poring through data on how physical activity can positively influence cancer prognoses. Her research could prevent or reduce some late and long-term effects of cancer treatment, including changes in heart function, body composition, inflammation and depression. 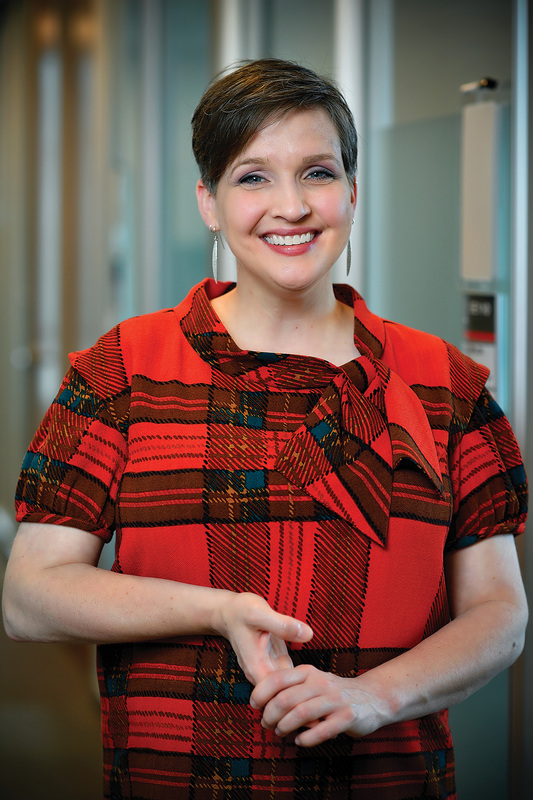 "What I enjoy most is that I have the privilege of working in public service," she says. "I get to spend my time and best effort helping the community." Bowles was drawn into kinesiology after playing sports all her life in her hometown of Lewisville. At UNT, the faculty in the College of Education gave her a personalized experience -- recognizing the areas in which she could grow. In her senior year, she began working with James Morrow, Regents Professor of kinesiology, health promotion and recreation, as part of the college's Developing Scholars Mentor Program. He introduced her to research and data analysis. "Dr. Morrow taught me how to work and behave as an academic," she says. "He also expected me to speak up and participate in class and department activities. He really pushed me and empowered me. I still call him up when I get stuck on things." Bowles minored in mathematics at UNT and had always been interested in statistics, so studying epidemiology seemed like a perfect fit. She earned her Ph.D. in epidemiology at the University of South Carolina, then worked for the Centers for Disease Control and Prevention in Atlanta. After completing postdoctorate work in Australia, she joined the National Cancer Institute in 2008. She developed technology-based tools to better assess physical activity in population research. Her studies also have touched on other effects of physical activity, such as weight control, although she says physical activity is beneficial regardless of body size. Bowles' current research focuses on cancer survivors and, like many projects, it can require years of study. "It takes some tenacity to work through the data," she says. "When you have those moments of insight in the research, it's really rewarding." But all that work comes with a higher purpose. "We all have a body we have to manage in order to navigate life," Bowles says. "Learning how it works allows us to make more informed decisions for ourselves and to better understand and assist others." In the late '70s, I met Bob Patton who convinced me to enter the exercise science program. Growing up wasn't easy, but that didn't keep Jonathan Johnson from reaching his goals.